You better believe I called David right away. Not because I was worried about the Porsche or the expense at all. I wanted to know that my son was alright! Fortunately, no one was hurt. The Porsche stopped suddenly when making a turn and David barely bumped into it. From the pictures I saw, there was barely a scratch on the bumper. Of course the jerk driving the Porsche is claiming thousands of dollars in damage along with injuries. He already has a lawyer and is trying to capitalize on the situation. So while this incident could have been a lot worse, we’ll likely be spending a lot of time and money to clear everything up. Fortunately, a few short years from now we won’t have to worry about this type of event anymore. And today, I want to show you how to capitalize on some big changes happening on our roadways! Driving seems to be a theme at my house right now. David had his accident just a few days ago. My 18-year-old daughter has been driving for a year now and is a big help with carpool when we need her. And my 16-year-old daughter is scheduled to take her road test to get her driver’s license this week! While I’ve been very careful to teach them as much as I can about safety, and we’ve logged hundreds of hours behind the wheel, my protective side is still worried about them. After all, there are so many unnecessary deaths on our roads. Just last week, one of my friends lost his brother in a tragic accident. A couple of years ago, a friend of mine turned left in front of an unseen vehicle and was killed instantly. And my kids felt their own sense of grief when one of their classmates died in a crash last year. And that number doesn’t even begin to touch the hundreds of thousands of accidents that did not have a fatality — but still resulted in immense costs in medical expenses, vehicle repair, infrastructure repair, lost productivity and more! Fortunately, something is being done about the dangers on our road. And you can be part of the solution while also collecting income checks and booking investment gains! It wasn’t all that long ago that the thought of a self-driving car sounded like science fiction. 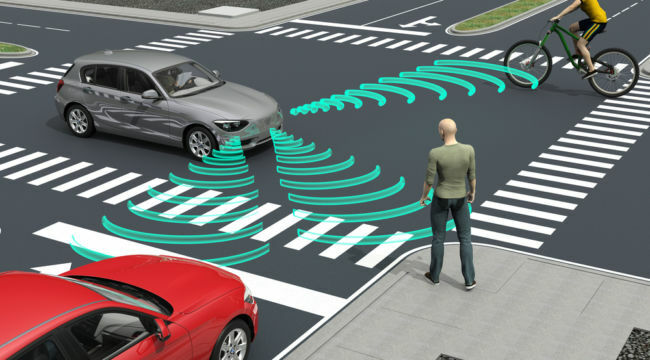 But many of today’s new vehicles are capable of operating with minimal input from a driver. And in a short time (probably only a couple of years), we will have vehicles that can completely drive themselves! Of course, this type of technology isn’t evolving overnight. It has taken hours and hours of programming time, vast technological resources, and plenty of trial and error to get self-driving cars on the road. And over the next few years, these investments are going to be even more intense! Self-driving cars will need an estimated 300 million lines of programming code to handle all of the variables the road throws at them. And computer systems will need to handle more than 1 terabyte of information per second to keep cars driving safely. With this demand for intense computer processing capabilities, semiconductor and memory chip makers are going to see demand increase sharply over the next two years. And communications firms that instantly send traffic and road condition data to fleets of cars around the country will also benefit. Companies like Broadcom (AVGO), Micron Technology (MU), Verizon Communications (VZ) and many, many more will be launching new business units tied directly to autonomous driving technologies. Automakers like Ford Motor (F) and General Motors (GM) will profit as an entire population shifts towards safer vehicles that have autonomous driving capabilities. I still have a lot of questions about how insurance companies will fare once self-driving cars become the standard. Because while there will likely be fewer claims, insurance companies will also be forced to reduce prices as fewer vehicles will wind up in costly accidents. The important thing is that many, many lives will be saved. Because self-driving cars don’t check their cell phones, get distracted by a billboard, or accidently run into Porsches while making turns. Thanks to autonomous driving technology, the future will be much safer — and much more profitable! And we’ll be tracking the best opportunities in this ever-growing market right here at The Daily Edge.